PHNOM PENH (AFP)--Cambodia's parliament has restored opposition leader Sam Rainsy's immunity from prosecution after he paid a fine for defaming premier Hun Sen's party, a lawmaker said Wednesday. The politician was stripped of his protection last month after accusing the Cambodian People's Party, or CPP, of corruption during elections last year and then failing to pay a $2,500 fine. His Sam Rainsy Party eventually paid the fine to the country's National Election Committee hours after his immunity was lifted. Lawmaker Cheam Yeap said the parliamentary permanent committee had voted Tuesday to restore parliamentary protection to Sam Rainsy. 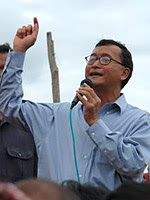 "Immunity of Sam Rainsy has been restored," Cheam Yeap said. The opposition leader, who is abroad, had called the removal his immunity "unconstitutional," saying under Cambodia's charter, at least two-thirds of lawmakers were needed to approve stripping legal protection of a parliamentarian. However Cheam Yeap said the decision was made in accordance with the law. The CPP took 90 seats of the 123 up for grabs in the July ballot, while the Sam Rainsy Party received 26 seats.